Music artist, philanthropist, and tech entrepreneur will.i.am spoke with Esri president Jack Dangermond about getting young people to develop new technologies and build tech companies. Besides great technical skills and creativity, what makes a good developer? According to Esri president Jack Dangermond, it’s having a sense of curiosity. 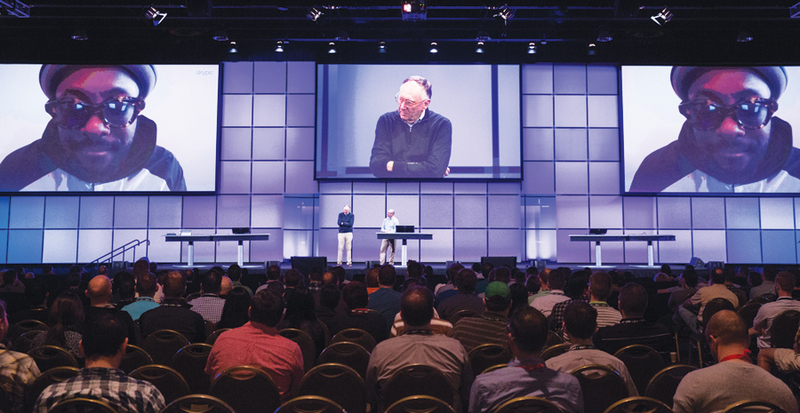 “One of the things that makes you special is that you are interested, not simply interesting,” Dangermond told 1,800 developers gathered for the 2015 Esri Developer Summit in Palm Springs, California, in March. Dangermond said it’s imperative to mentor the next generation of creative and curious developers. One person dedicated to doing that is will.i.am, the global music artist, philanthropist, and tech entrepreneur. Besides creating a tech company, he is supporting young people studying technology and encouraging them to get involved in tech. “A couple of years ago,” Dangermond told the audience, “I became friends with a very special person: will.i.am. He is not only one of the greatest entertainers in the world—he [cofounded] The Black Eyed Peas—but he is also a genius with respect to tech. He’s building various kinds of wearable devices, and his development team is embedding geography into personal devices.” Calling in via Skype, will.i.am spoke with Dangermond about the importance of getting young people interested in being tech developers and entrepreneurs. The fashion/tech company i.am+, which will.i.am founded, is currently developing the PULS smartband, which includes maps and routing supported by Esri ArcGIS. will.i.am also wants young people to follow in his footsteps, developing new technologies and building tech companies. So he has thrown his support behind at-risk students at Roosevelt High School in his hometown of Boyle Heights in East Los Angeles, California, through his i.am.angel foundation program called i.am College Track. Working with Dangermond and other giants in the tech world, the program provides students with software, such as GIS tools, along with hardware for class projects. 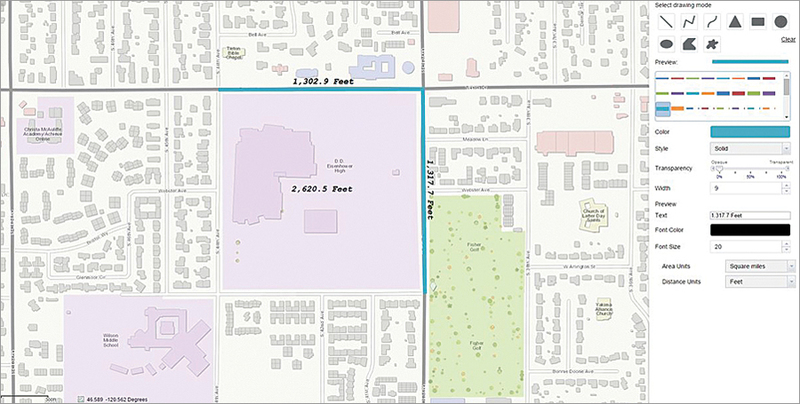 Tom Sellsted, from the City of Yakima, Washington, used the developer edition of Web AppBuilder for ArcGIS to create a widget that displays a running total of the segments measured. Today, many students in the i.am angel foundation’s Science, Technology, Engineering, Arts, and Math (STEAM) initiative have increased their grade point averages and are building mapping and other types of apps and working on robotics projects. Some i.am College Track students who graduated from Roosevelt High School with top grades are attending the University of California at Irvine on full scholarships, said will.i.am. The i.am.angel foundation also sponsors i.am STEAM hackathons to teach students how to code. One event, the CodeDay LA Hackathon, was held recently at the i.am+ headquarters in Los Angeles. One of the problem solvers in mobile app development is John Tomizuka, cofounder and chief technical officer of Taqtile, a mobile app development firm based in Seattle, Washington. Taqtile has developed apps for online retailers, President Obama’s inauguration in 2012, and NBC’s coverage of the wedding of the United Kingdom’s Prince William to Kate Middleton in 2011. 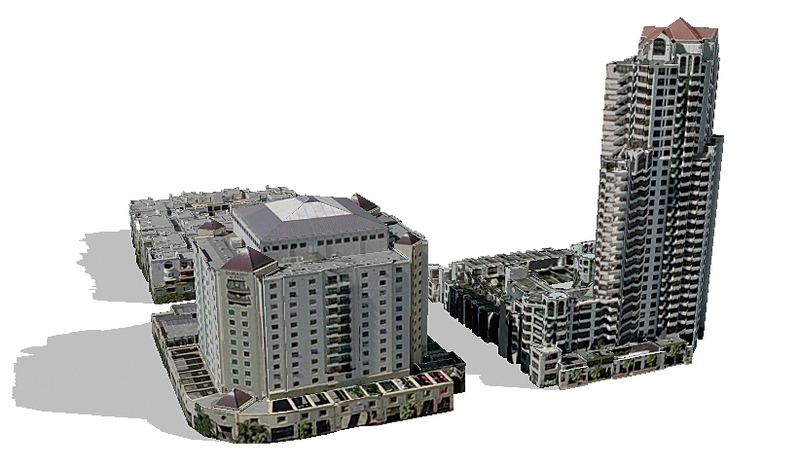 It's easy to switch between real-world symbology and thematic floor-count symbology—on exactly the same 3D building model data—with ArcGIS Pro. He contrasted that with developing a mobile app for Netshoes, an online sporting goods retailer in Brazil. Taqtile interviewed potential app users and collected data on how they used e-commerce apps. The app was a hit, with one of the most successful aspects being a real-time chat feature that let the customers chat with a Netshoes employee about a product or the status of an order. “This is a big success,” said Tomizuka, adding that the app had 750,000 downloads and 500,000 active monthly users and generated a large number of purchases. Geosolutions are needed to solve the world’s major problems, and Esri wants to work cooperatively with developers as the company builds technology to tackle those issues, Dangermond said. Since knowledge about Esri’s code will be key, Esri will continue to pop open the hood of ArcGIS technology to help geodevelopers build great things. “Our technology is modular and structured into thousands of components,” Dangermond said. “These are the components that Esri’s developers use to build the platform. In the last couple years, we’ve opened up that structured code—some with open source and APIs—so that you guys develop with exactly the same code that our own software engineers do.” Dangermond said he wants developers to be Esri’s colleagues in advancing geosolutions. “We want you to be . . . part of the fabric of what we’re working on,” he said. Christopher Moravec, director of products for Eagle Information Mapping (an Esri Gold Tier partner) in Houston, Texas, likes Esri’s philosophy of working collaboratively with developers like himself while always upping the ante and improving ArcGIS. “I like the culture of the company—to push the [technology] limits,” said Moravec, whose firm creates data management and analysis tools for companies with oil and gas pipelines. Esri director of software development Sud Menon kicked off the technology demonstrations by providing a holistic overview of the ArcGIS platform. He explained how the platform includes ArcGIS for Desktop, apps, and APIs powered by ArcGIS Online and ArcGIS for Server in the cloud or in an organization’s infrastructure. “We have been working hard on building a cohesive platform that knits all these elements together for enterprises, organizations, developers, and their audiences,” he said. He highlighted Esri’s new 3D web GIS technology, which includes web scenes that represent 3D maps. Scene layers depict features displayed in 3D including points, lines, polygons, 3D objects, and 3D meshes. “You can also work with map and image tiles and dynamic map and image layers,” he said. Menon emphasized the platform’s ready-to-use maps, apps, imagery, demographic information, and other data that Esri offers. The apps include Esri Story Map apps, Explorer for ArcGIS, templates, Operations Dashboard for ArcGIS, Collector for ArcGIS, GeoPlanner for ArcGIS, Esri Maps for Office, Web Scene Viewer, ArcGIS Open Data, and a crowdsourcing solution template. Menon also underscored the recent release of ArcGIS Pro, the new application in ArcGIS for Desktop that provides powerful analysis, editing, and visualization in 2D and 3D, and a guided workflow called Tasks—preconfigured steps that walk users through a business process. 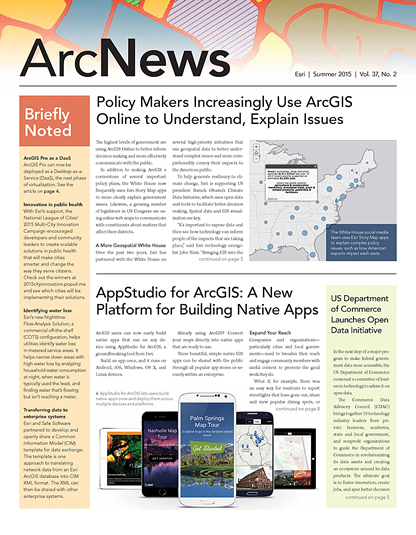 “We are excited about [ArcGIS] Pro and the power it brings to people who need to do analysis on the desktop,” he said. “For me, you can’t walk away from here without being inspired,” said Sellsted, who used the developer edition of Web AppBuilder for ArcGIS to build a custom measure widget for his organization. The widget provides a running total measurement for each segment (e.g., area units, such as square feet, square miles, or hectares, or distance units, such as feet, meters, and miles) as it is being drawn. Other well-received technology at the summit included smart mapping in ArcGIS Online, which helps people quickly make beautiful, useful maps with the data they have on hand. With data-driven workflows, smart mapping provides smarter initial settings for the map being made, including color, scale, and styling. The audience clapped when Esri’s Marc-Olivier Briat announced that later this year Esri would support creating and displaying maps in the vector tile format, which enables fast, high-quality display of content and reduced cache sizes. Another crowd pleaser was AppStudio for ArcGIS, which developers can use to build a single mapping app that will run natively on multiple platforms, including Microsoft Windows, Apple iOS and OS X, Android, and Linux. In closing the technology demonstrations, Jim McKinney, Esri ArcGIS program manager, told the audience that in 2015, Esri will have in place a huge amount of innovative capabilities for developers. “Think of the entire platform as your development space,” he said. Esri’s next developers’ summit, DevSummit Europe, is happening November 10–12 in Berlin, Germany. To register, visit esri.com/events/devsummit-europe. The next Esri DevSummit in Palm Springs will be held March 8–11, 2016, with preconference training sessions scheduled March 6–7. Visit esri.com/devsummit for more information.